ECMAScript does not use classes such as those in C++, Smalltalk, or Java. Instead you can create objects several ways including via a literal notation or via constructors which create objects. An object is a container for a bunch of values and methods. A property is a name and value. Let’s look at a sample object. You initialize all or part of any object by assigning initial values to their properties. More on literals in a following section. You can have a getter and setter functions. I will want to be able to get the value of a task programmatically. Methods are properties that contain a function() object, whose intent is to operate on the object. In the example, we can add a getUrgency() method that will retrieve the urgency of the task object. 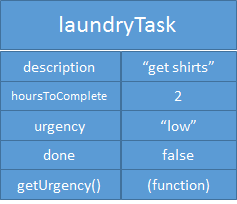 For our tasks, we might want to create code with a bigger idea than just laundryTask. We might be able to use the same code for a more generalized Task object by using a constructor. A constructor prepares the new object for use, often accepting parameters that the constructor uses to set member variables required for the object to reach a valid state. It is called a constructor because it constructs the values of data members of the class. We can create Task objects now, just as we do with String objects. 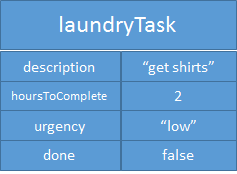 The Task() constructor constructed laundryTask but can be used as a powerful, centrally defined object factory to be used for creating more Task() objects. As you craft your own constructors for producing custom objects you build up prototypes and the ability to inherit behaviors in your Task() instances. A constructor uses the new keyword. The new keyword must be followed by a function. A function used in this way is called a constructor and serves to initialize a newly created object. The new object that is returned from the function is an instance of the constructor function that constructs it. Each constructor is a function that has a property named ― prototype that is used to implement prototype-based inheritance and shared properties. More on prototypes in the next post in this series. creates a new Date object. Invoking a constructor without using new has consequences that depend on the constructor. For example, Date() produces a string representation of the current date and time rather than an object. An object literal is an expression that creates and initializes a new and distinct object each time it is evaluated. Literals let you build objects “on the fly”. Object literals are used to encapsulate data, enclosing your data into a single object to minimize the use of global variables. When you use literals, you do not need to invoke constructors directly or maintain the correct order of arguments, instead you specify them. Object literals are also useful for unobtrusive event handling, as a way of holding data that would otherwise have been passed to functions called from HTML event handler attributes. 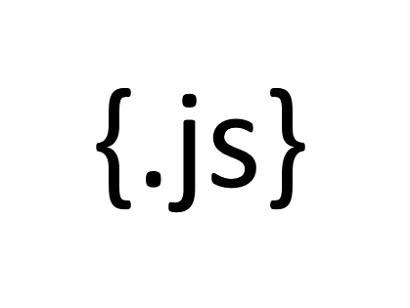 String(). You can access each character in a string with its position (index). String indexes are zero-based. Date(). Once a Date object is created, a number of methods allow you to operate on it. Most methods allow you to get and set the year, month, day, hour, minute, second, and milliseconds of the object, using either local time or UTC (universal, or GMT) time. RegExp(). A regular expression is an object that describes a pattern of characters. When you search in a text, you can use a pattern to describe what you are searching for. Objects are mutable and are manipulated by reference rather than by value. If the variable x refers to an object, and the code var y = x; is executed, the variable y holds a reference to the same object, not a copy of that object. Any modifications made to the object through the variable y are also visible through the variable x. An object’s prototype is a reference to another object from which properties are inherited.An object’s class is a string that categorizes the type of an object. An object’s extensible flag specifies (in ECMAScript 5) whether new properties may be added to the object. We’ll describe prototypes in the next post. writable attribute specifies whether the value of the property can be set. enumerable attribute specifies whether the property name is returned by a for/in loop. configurable attribute specifies whether the property can be deleted and whether its attributes can be altered. To change the default property attributes, use the Object.defineProperty() method. It accepts three arguments: the object, the name of the property, and a descriptor. In this example, we defined a bruce object that did not have any properties. Then added the name property that is read-only. In strict mode, an error is thrown if you try to change bruce.name. You can get information about the property descriptors too. The first syntax, using the dot and an identifier, is like the syntax used to access a static field of a struct or object in C or Java. The second syntax, using square brackets and a string, looks like array access, but to an array indexed by strings rather than by numbers. This kind of array is known as an associative array (or hash or map or dictionary). And you can delete properties. When creating custom constructor functions intended to be used with the new operator, it’s best practice to make the first character of the constructor name uppercase: Task() rather than task().